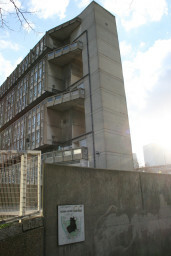 Recent controversy surrounding the demolition of Robin Hood Gardens estate in Poplar, east London, has exposed an array of prejudices among politicians, architects, and critics. Margaret Hodge’s dismissive remarks on concrete, and determination to demolish The Smithson’s landmark RHG estate of 1972, have inspired Building Design to launch a protection campaign backed by Richard Rogers, articles in The Observer and reports on Radio 4’s Today programme. But so far all responses have failed to look honestly at the situation, and focused almost exclusively on architectural heritage. The 213 flats, arranged in two 10-storey blocks, are wedged next to the entrance to the Blackwall Tunnel, and in the shadow of Canary Wharf. Rogers’ likening their arrangement ‘to the great Georgian crescents and squares in Bath’ is disingenuous. Apart from a cursory interview with residents who backed the BD campaign, the voices of the residents who currently live in RHG, have not been heard. 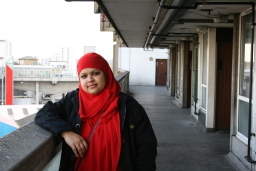 Shopna Khan, 34, who lives with her husband and five children in a two-bedroom flat says that over-crowding and leaking were the main reasons people opted for demolition in a vote organised by English Partnership and Tower Hamlets. ‘Most of the vote that English Partnership got is because of over-crowding – people thought it would be a golden opportunity to be re-housed, and get a reasonably-sized house.’ Shopna has been requesting for nine years to be re-housed. As BD focuses on the fate of the crumbling concrete, tenants are now facing an uncertain future. Initial promises of retaining council tenancy have been revised, and the community has no knowledge of where they will be re-housed. Nasima Begum, mother of two, and administrator in the local school says of Tower Hamlets’ and English Partnerships’ strategy: “They have their own plan, and gradually will be putting things in front of us.” Residents now feel that the vote was swayed with promises of bigger council properties, but that guarantees are not being upheld. The Smithson’s design of the estate was based on the philosophy that a sense of belonging was crucial to human happiness. They wrote: “Belonging is a basic emotional need. From ‘belonging’ (identity) comes the enriching sense of neighbourliness. The short narrow street of the slum succeeds where spacious redevelopment frequently fails.” Their ‘streets in the sky’ were intended to foster this spirit. The couple would have been delighted to hear mothers describe how they leave doors open and spend the day outside, or going in and out of each other’s flats. The Smithons would be less delighted that cracks and leakage are a constant part of these families’ lives. There are other problems with the design. In the duplexes the small kitchens are separated from the rest of the living areas by steep awkward stairs. Shallow ‘balconies’ – no more than a foot in depth – are another missed opportunity. Housing can’t work as a monument or exist as part of architectural history for its own sake. It has to work now in the present, and is ultimately expendable if it is unfit for purpose. So the question is: is RHG fit for purpose, or could it be made so with the £70,000 investment that has been quoted per unit? And if it was refurbished, would it be maintained as social housing or would it, like Goldfinger’s Trellick Tower be ‘snapped up’ by design-savvy buyers? This statement reveals a prejudice that is indicative of a large proportion of Britain’s media class. If Bayley knew one thing about the people living in RHG, he should know that the predominantly Muslim community who live there tend to stay married. The ingenious use of limited space which families come up with to make a decent home is impressive; the community, self-empowered and well-supported by a progressive local school, provide a network of friendship, and if anyone – heaven forefend – struggles with a buggy, you can be sure that they are soon given a hand. The Smithson’s brief was not to provide housing for professionals living self-contained lives, it was for families. The flats in RHG do not provide adequately in size or structure for them. No amount of restoration would change this. Internally they fail the families that live there, and many council flats before and since have done a much better job. The vision of The Smithsons is important but when it comes to practise we can improve on what they pioneered. This should be their legacy. There are new materials at hand to meet the same old human needs, which The Smithsons valued but ultimately failed to serve. RHG should be pulled down, but with the provision that the Smithsons’ spirit endures. Ruth Hedges is a freelance writer and radio producer. 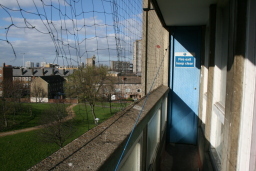 She worked with Woolmore Primary to make a series of podcasts, featuring residents from Robin Hood Gardens and the local area designated for regeneration.